This photo reached me via facebook and made me wonder: wouldn’t it be great to make public transportation more fun? 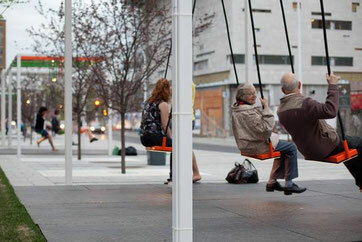 Waiting at this bus stop in Montreal would be so much more enjoyable… not just for kids, but for everyone! Some years ago while visiting New York City, my husband and I were struggling to figure out how to best get across Brooklyn with our newly purchased double-decker stroller and two sleeping kids inside. We found a bus stop, waited, the bus pulled up - and then we were in no uncertain terms told by the bus driver that “Strollers are not allowed on the bus”. What??? We could hardly believe this! The driver clarified: “You have to fold it up, to get on”. Hmm… Any parent would start either laughing or crying at this point. After all: two SLEEPING kids in the stroller are basically any parent’s jackpot. One does not mess with them – ever! And to take them out, AND to take all the stuff out of the stroller, to fold it up, and get on the bus… this would take a team of four people and about ten minutes. Not fun! Today I can’t even recall anymore what we did that day: maybe we ended up walking far, or we changed our plans… ? But the bottom line was: buses in NYC are NOT child-friendly, and therefore NOT parent-friendly! A year or so later, our family was on vacation in Stockholm. Similar scenario: two kids asleep in double stroller, found bus stop, waited, bus pulls up, and: the bus is easy to get on to thanks to a lowered step and exta wide doors. We get on and I go to the front to buy tickets from the driver. And guess what he tells me, as if it’s the most basic idea in the world?! “You don’t need to buy a ticket if you get on with a stroller. People with kids go free!” What??? Needless to say, we were giddy for hours. What a civilized place! Such wonderful people! And such great buses... Incredible! So, Stockholm takes today's award for child-(and parent-)friendly city! I recently read that kids go free on London public transportation. Will do some research on that soon, so stay tuned!